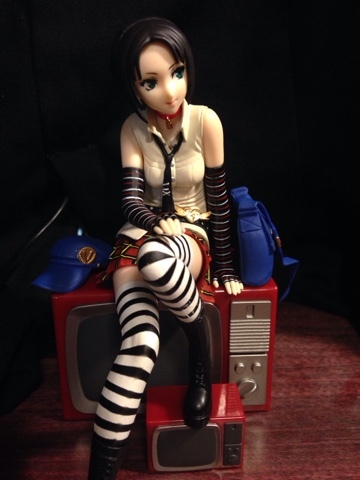 I have an addiction - Persona 4 character figures. They're so colourful and loveable in the games that whenever I see them (especially at a good price), I can't stop myself from buying them. During a recent visit to a pre-owned figure store, I was about to leave the store empty handed when I saw this figure of the adorable tsundere Marie for $20, boxed and all (which can be rare when shopping at pre-owned stores). The Marie figure I purchased happens to be a 'prize' figure. Upon doing some research on the 'myfigurecollection.net' forums, I found that prize figures are different to scale figures. To put it simply, they're a style of figure made more cheaply than scale figures and are sometimes known to be of a lower quality. While I can maybe notice my Marie figure is shinier than my other very 'matte finished' figures and some of her accessories feel a little cheap, I'm happy to say that I love looking at my Marie figure just as much as my other figures and that's really what matters. 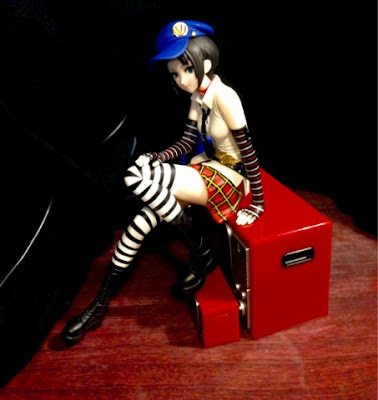 Marie is featured wearing her signature outfit from Persona 4 Golden, complete with her bag and her hat as removable accessories. Each piece is shaped to sit on it's intended area - the hat can be sat on Marie's head and the bottom of her bag is perfectly flattened in order to sit on top of the mini TVs included for her to be perched upon. A small complaint I have is that Marie's hat is a little difficult to put on and is guaranteed to come off when I move it - there's no proper way to secure it onto her head and balancing it can sometimes be difficult. Apart from that, I love how accurate her outfit is and am very impressed with small details (such as her belt buckle) that I had long forgotten about until inspecting this figure. Complimenting her look and personality is her pose. On the box, she is sitting in a relaxed fashion on top of one of the two included TVs. Her body parts are not movable, but you can pose her with or without the TVs. The bigger TV is actually slightly molded and indented to perfectly fit her backside so she can sit easily, and the smaller TV sits just under one of her feet. 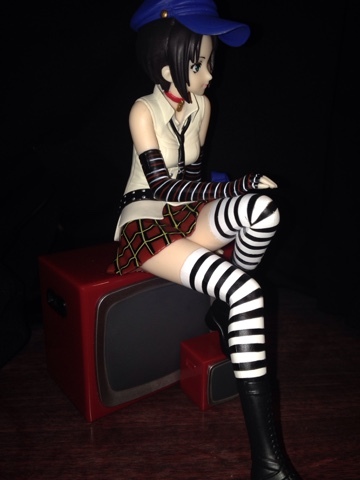 Thanks to this pose and the smaller TV, she is well supported and easy to pose and turn after moving her. The additional display without the TVs is possible thanks to her flattened behind area to help her sit comfortably on the TVs and lean her on bench tops or against other items to have a perched cutely on a shelf or leaning back slightly on a bench. 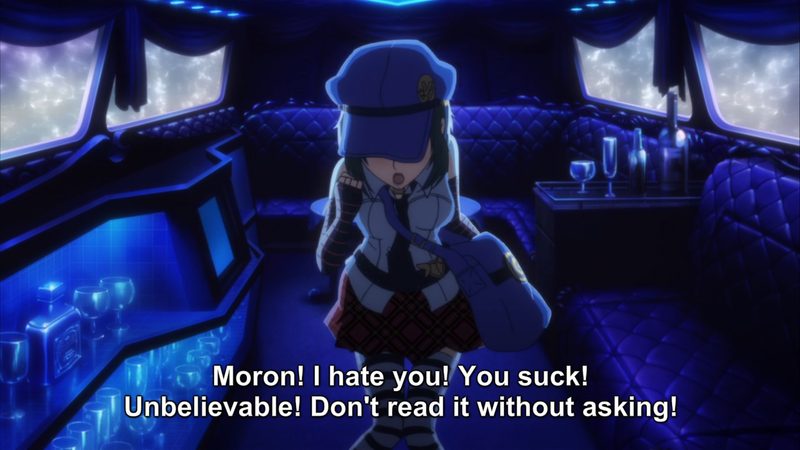 Quality-wise, Marie is at an average level. The figure itself is visually very good, especially an average distance. Close-up though, there are a few paint smudges here and there and a tiny chip on the bottom of the back of her vest. As I mentioned, the figure was bought pre-owned so I'm not sure if these slight differences were there before her first owner had her, but I've never really noticed these kinds of things on any of my other figures. Also, the TVs Marie sits on feel like cheap plastic and are noticeably shiny. Even if this is intentional, the TVs feel incredibly light, almost hollow in fact. This does have it's benefits though, as as a lighter figure does equal lower shipping costs, but I was a little surprised. However when you factor in the price of Marie, this is probably the type of quality I would expect for price and for the low price, these things are definitely forgivable as she looks nice enough. She may not be the most perfect or most expensive figure, but considering the cost she's pretty great. Despite some very minor chips and paint smudges, I totally appreciate the attention to detail in Marie's features and the cute customization options, thanks to the included accessories and posing options. From far away, Marie stands out against other figures thanks to her clothes and her pose that completely reflects her attitude and all the flaws I mentioned definitely aren't noticeable unless you have a very good eye. 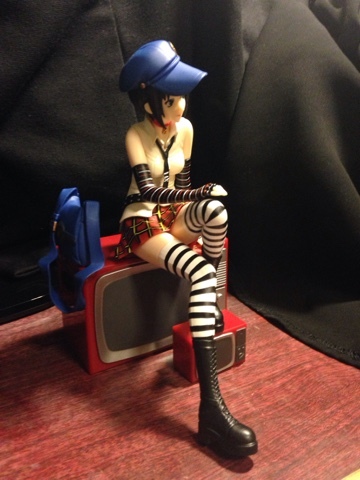 If you're a fan of the Persona 4 characters and Marie, until there's a higher grade option, this PM Figure is a fine addition to anyone's P4G character collection. Not perfect, but still very cute, and totally worth the cost. Do you dig this figure or will you buy another Persona 4 character instead? Comment below and let us know! Thanks for stopping by and make sure to follow @JRPGJungle on Twitter for updates on content and random, shorter musings on JRPG news and games!